Dimensions:3 14" x 1 58"
This is the classic snapped base Decatur made out of Coshocton that is so interesting. To start with, the flint has the beautiful blue hues. Also, there are a couple of quartz inclusions, one with glacier blue flint. The blade has an abundance of mineral deposits with all edges showing heavy use. In addition, there are a couple of fossil inclusions in the material. 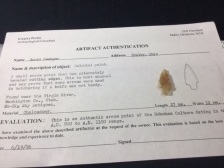 It is a nice sized artifacts with a tip rounded from use. It is broken at the midsection and glued back together. It comes with Bennett's COA and I have the shipping.